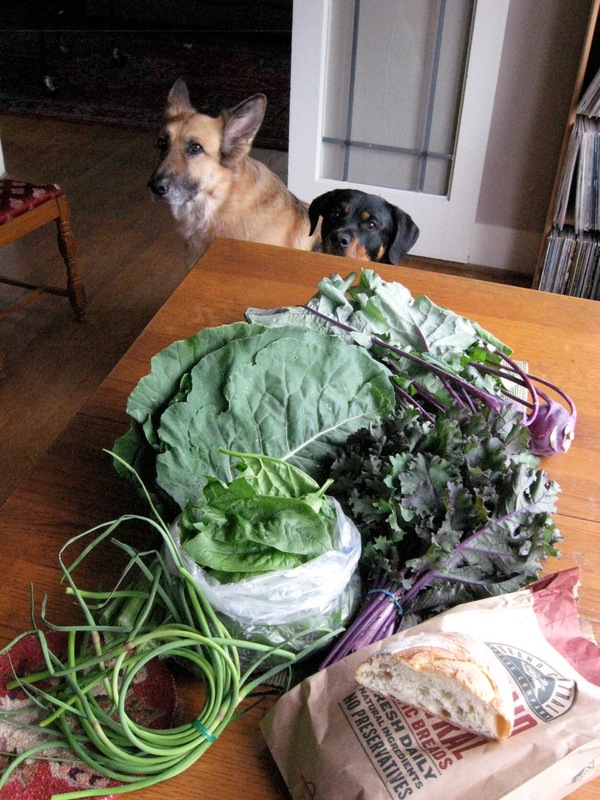 I picked up my first CSA (Community Supported Agriculture) share of 2012 produced by Sol to Seed Farm in Carnation. I anticipated that the season would start next week and end October 31st (20-week session) but weather has dictated an early start this year and I’m pretty pleased about it. As expected, this first box is full of green and purple vegetables–big healthy bunches of great looking (and deliciously tender) produce that I am looking forward to cooking and eating throughout the week. Starting tonight I’ll be using the spinach and garlic scapes in enchiladas. Communications leading up to today have been excellent from farmer Matt Tregoning, who followed up by email this morning with helpful recommendations on ways to simply prepare the garlic scapes and kohlrabi- the lesser known produce included this week’s share. Though I’m personally familiar with all produce, it’s still a nice gesture. Matt suggested making garlic scape pesto (which I love)…but I will most likely be grilling them and adding to a potato salad this weekend. A colorful crunchy salad of julienned kohlrabi, carrot and beets with a herb/mustard vinaigrette will use up the kohlrabi. The kohlrabi and collard greens can be sauteed with garlic cloves (maybe some scapes, too) and hot pepper flakes and served with pasta, beans/lentils or rice and cornbread. I will collect my share from Grand Central Baking Co in Eastlake every Wednesday through the season until Matt says to stop. Last year I found it difficult to schedule my Sunday pick-ups at the farmers market because of out of town weekend travel and parking hassles. Having the option to pick-up a CSA mid-week at a local business 2.5 miles from my house, that also supports local farms (and also gave me a free loaf of organic bread today!) is really valuable to me. There are many great CSA models out there to choose from. Finding one that fits your needs and lifestyle is easier than ever. Good resources specifically for CSA’s are Puget Sound CSA Directory (local to Seattle) Local Harvest (national). I’m looking forward to the rest of the season. It’s off to a great start. Thanks Matt and Deanna at Sol to Seed Farm!